- Performance and stability improvements. . We hope you enjoy playing Sudoku. We read all your reviews carefully to make the game even better for you. Please leave us some feedback why you love this game and what you&apos;d like to improve. 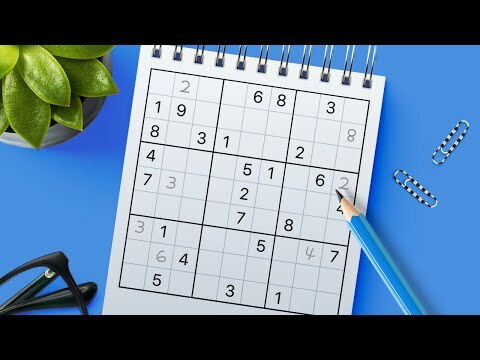 Keep your mind active with Sudoku! Sudoku for beginners and advanced players. Whether you&apos;d like to relax or keep mind active – pass your free time in a pleasant way! Get a small stimulating break or clear your head with sudoku. Take your favorite app with you wherever you go. Playing Sudoku on mobile is as good as with a... see more Sudoku for beginners and advanced players. Whether you&apos;d like to relax or keep mind active – pass your free time in a pleasant way! Get a small stimulating break or clear your head with sudoku. Take your favorite app with you wherever you go. Playing Sudoku on mobile is as good as with a real pencil and paper. Choose any level you like. Play easier levels to exercise your brain, logical thinking and memory, or try hard levels to give your mind a real workout. Our classic puzzle game has some features that make sudoku easier for you: hints, auto-check, and duplicates highlight. You can use them or complete the challenge without help – it&apos;s up to you! What&apos;s more, in our app each puzzle has one solution. You will find all you need whether you are playing your first sudoku, or you&apos;ve progressed to expert difficulty. ✓ Turn on Pencil mode to make notes as on paper. Each time you fill in a cell, notes are automatically updated! Train your brain anywhere, anytime!